The boy I am going to tell you about was born to a young woman who already had three children.She was poor and her family were often very hungry. They lived in the Deep South of America. The woman loved her children and wanted to try to feed, clothe and send them to school.When she found she was pregnant for the fourth time she wondered how she could possibly cope with another child. “God will provide,” the preacher told her. She thought that that would be the only way the child would survive, if God provided. She did not think that she could feed yet another child.Her milk had run dry with the third child, a little girl.That one, she had hoped would be her last. But Nature has a way of changing things around, and less than twelve months after the birth of Lisa, a boy was born.He was called Abe. As the mother suspected she could not find enough food to feed herself and provide milk for the baby. Fortunately her sister who lived in the vicinity had milk to spare and she offered to feed the child. This was a great relief to Tam, the mother. At least the child would live for a few months without being a drain on the meagre resources of her family, while she got her strength back. Tam went back to her cleaning job, taking Lisa with her. Little or no money came from Tam’s husband who liked to sit around in the local bars all day. Tam would spend the money she earned on food rather than take it home to be stolen by her man and used for beer. Life was very hard for Tam and her family. The baby Abe often stayed with Tam’s sister for days at a time. Tam was too tired to pick him up. Tam’s sister was a kind woman who had a little more money than she did, as her husband brought home a wage for his family. After Abe was about six months old and her own child reached 9 months, her milk dried up. Her husband said it was time the baby Abe went back to his mother. He said it was hard enough to keep his own family clothed and fed, without having to feed little Abe, who after all was her sister’s child, not hers, and certainly not his. Her sister felt very uncomfortable about approaching Tam with the problem.In truth she knew that Tam was hoping that she would be able to keep the child for a year or two ‘just until she got herself straight’. Tam’s sister didn’t think that would ever happen. But Tam didn’t think she could do that, after all he was the daddy of her children and she had married him. In her marriage vows she had agreed to take him for richer and for poorer.Poorer they were, but the promise still held. Tam begged her sister to keep the child. Her other children sometimes went to bed hungry and crying. She prayed to God asking what she should do. In her dream she saw herself taking the child to the mission house. They would take him and she would vow never to have any more children. The people at the mission tried to persuade Tam to keep her child, but she said it might die if she did. At least the child would have a chance with them. Nothing they could say would persuade her otherwise. They could see how thin she was and they knew about her other children so they agreed to take Abe on one condition. She must never try to ask for the baby again. They would change the child’s name and hopefully another family would adopt him. Tam agreed and feeling very heavy hearted left the baby in their care. There was an orphanage at the mission; there were ten children of various ages. People would come and adopt the younger ones sometimes, but somehow Abe, now called Michael, never found parents as a baby. He stayed at the orphanage and grew up with the gossip of the other children and the carers moving round his mind. He learnt that his mother did not want him and that because of him his brothers and sisters were starving. The carers were not very good at keeping the news from the villages to themselves. They heard that Abe’s sister had died, and of course this news travelled to Abe who was now seven years old. In his young mind he thought it must be his fault that his family were hungry and his sister had died. He wished he had never been born. Fortunately there was plenty of food in the orphanage and Abe grew up to be a strong young lad. He was taught how to read and write, and he helped in the garden to grow fruit and vegetables for the orphanage. A man and his wife appeared one day saying they were looking to foster a young lad. They had lost their own son and wanted to give another child a chance in life. They did not want a baby but a boy of ten or eleven who would enjoy working with the animals on their farm. Abe, now Michael was the only boy of that age in the orphanage. He had grown used to his life there, used to feeling guilty, knowing that everything was his fault and that he was worthless, or why would he have been left by his own mother? When he heard that the couple were looking for a child of his age to foster he did not want to go with them. He did not feel he could trust them. They too might decide he was not good enough, then where would he be? The matron of the orphanage knew Abe well enough to understand what was going through his head. Abe thought about what had been offered to him.He realised maybe for the first time that matron knew how he felt and what he was thinking; it was the first time that he thought that maybe he had been thinking wrongly. He understood enough about life now to know that it is not a child’s fault that it comes into the world. The child is not to blame if his parents cannot look after him for whatever reason. He began to realise that from his experience in the orphanage usually children do not know the reasons their parents give them away, sometimes they guess and guess wrongly. It doesn’t do any good blaming anyone, the parents or the child. What happened, happened.The question is how to deal with it. In Abe’s case he took the chance and after a wobbly start he became a member of a proper family. He let go of his feelings of guilt and his foster parents explained that his mother had been told that she must never try to contact him again. But she had not abandoned him in her heart even if she was never to see him again. She had moved away to another town and Abe thought that maybe when he was older he would try to find her to tell her he had forgiven her. That thought made him feel better. The solid tightness in his chest loosened and he was able to look people fully in the face and know he was a worthwhile person, even if bad things had happened to him in the past. Abe grew up and became a teacher. He always paid extra attention to any children in his class whom he knew had been fostered. There were always one or two. He helped them to value themselves and their talents and to be the best that they could be. He did a good job. 1. Does this story remind you of anything in your life? 2. Why do you think little Abe felt guilty, as if he had done something wrong? 3. Do you think a baby or young child can ever be blamed for becoming an orphan or needing foster care? 4. Why do you think that Abe was unsure about going with the family who offered to adopt him? 5. Do you think Abe worthless, or did he manage to overcome his early difficulties and become able to help others? 6. How did the story make you feel? Why? A woman wearing a blue nun’s headgear told me this story as I meditated for Corrine. When I was a girl I had a dream. My dream was to marry a prince who would love me forever. That was my dream. Now, I knew there weren’t many princes about, but never the less I thought I might find someone who was ‘prince like’ enough for me to want to marry him. And of course he would want to marry me. Why not? I was beautiful. I had long golden hair and my mother told me I was beautiful. In fact when I became a teenager I think I was too beautiful for my mother. I think she became a little jealous of me, just as I was becoming more beautiful, she was becoming less beautiful. She was always fretting about the next wrinkle that appeared on her face and the weight that was growing on her hips. She didn’t seem to love me as much. My mother and my father split up when I was about twelve. It happened gradually. He started to go away for his work. He was away more and more. My parents used to argue about it. My father refused to work in the store. ‘You’d get sick of me,’ my dad would say. My father didn’t seem to like to hear that my mother loved him. I never heard him say he loved her. Gradually, as the months and years went by, my father drifted away. I had told my mother about my ‘Prince’ when I was a little girl. As I grew up sometimes she would refer to him. ‘Trouble is, Honey, you can’t rely on princes to buoy you up. You’ve got to do it for yourself. You gotta learn to look after yourself whoever you spend your time with. You can enjoy his company for a while, maybe for a long time, or forever, but unless you feel good and strong in yourself he won’t be staying anyway. Men don’t like women to be hanging on to them, depending on them too much. That’s the trouble with princes, they want to do everything for you in the beginning, then they get bored and they’re off. And women who have had everything done for them don’t know how to do it for themselves and feel lost. My mother and I got closer after my teenage years when she had settled into her life without my father and I was less self centred and hormonal. We get on fine now. She has become a good friend along with several others that I have. And I do have a man, and he isn’t a prince, and I don’t know if he is going to stay forever. It doesn’t seem to matter too much because I know I can look after myself if I need to, and he can look after himself too, so I don’t have to worry about him. We share the work and the play, and that’s good. A woman wearing tartan skirt and shawl came to tell me about her life as a young child. Hello, my name is Mrs McIver, Mary McIver. You can call me Mary. I’ve come to tell you about myself. 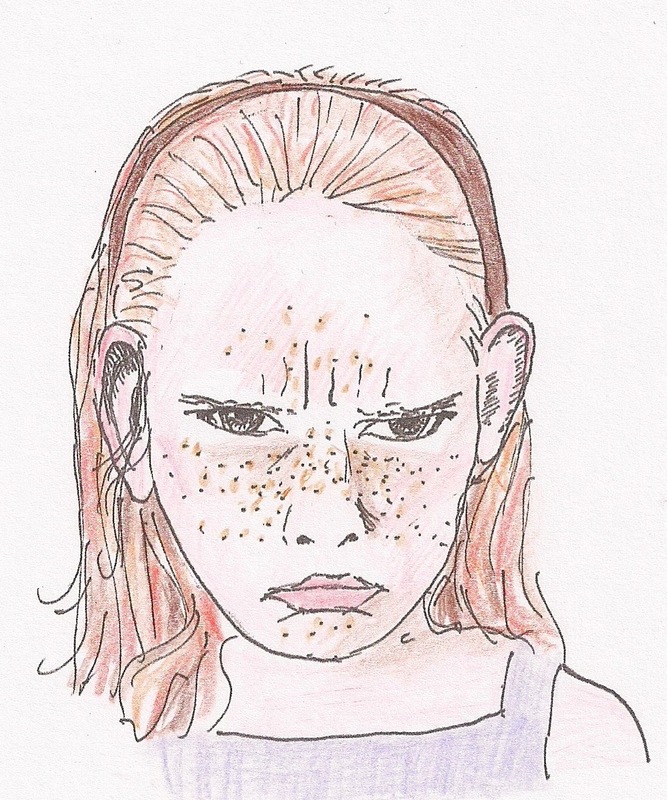 When I was a young lassie I had red hair and freckles. My family looked different from me. My mum and dad had straight brown hair. My brothers had blond hair, but I had reddish curls and lots of freckles. Sometimes they teased me and I used to get cross. I used to shout at them when they said I needed a good wash in the burn (stream) to get rid of them. I knew I was clean. They knew I was clean. Why did they tease me? Families can be like that sometimes. They like to give you a label. My sister was known as ‘the quiet one’. One of my brothers was ‘the rowdy one’, the other was ‘the clever one’. I was ‘the angry one’. They used to say it was because I had red hair, and that would mean I would be a cross kind of person. I had a friend in school that had red hair too, and freckles. At least she wouldn’t tease me. I didn’t used to get cross with her. She was lovely. We used to play such great games. We had trees in our playground. We pretended we had horses and we would gallop in and out of the trees and tie our horses up to the tree we called our stable. She was called Dianne. One Day I heard that Dianne had left my school. She just disappeared. I was so upset. Who could I play with now? The other kids all seemed to have their own friends. They didn’t want me. My brother ‘the rowdy one’ didn’t help. He and his pals came over to me sitting alone on the step in the playground. He didn’t know about my friend leaving. “What’s the matter with you, misery guts?” he asked. It was just not true. But I had discovered that being angry instead of being upset made me feel a bit less upset. So I used to get angry every time I was upset. Instead of crying and explaining why I was upset I would just get very, very angry. People would turn away instead of helping me to sort out what was upsetting me. They didn’t like it when I was angry. It was little things that made me angry – like when my brothers or my sister seemed to get more of something than I did. Or if they had a chance to go somewhere or do something and I didn’t. I didn’t tell anyone how I was feeling. I just screamed. I used to get into such a state. I’d hammer on the walls and stamp my feet. I’d get sent up to my room. I’d feel like I was burning up inside. If anyone came to see how I was I’d throw something at them. I only felt better after I’d had a sleep. Then I’d want to forget about it and I’d be OK until the next time. I thought it was all right to do what I did. Nobody seemed to think I could change. But one day my Grandma’s sister came to stay. I had only met her once before. My family always said she was a ‘good listener’. I was in one of my terrible moods, shut in my room. I heard her voice outside my door. I didn’t think I should chuck anything at her. She wasn’t really in my close family so I thought I mustn’t be horrible to her. When she came in she just sat on my bed and reached out her hand for mine. I let her take my hand and I felt all the anger and tightness in my chest just turn into tears and sobs. I thought she, if anyone, would listen to me. I told her about my red hair and my friend leaving, and being lonely. She listened to it all. I let her tell my Mum and Dad. When they came into my room there was a different look on their faces. First I hugged my Mum and then I hugged my Dad. It made such a difference to me. I can’t say I never got angry again, but I wasn’t afraid to tell people how I was feeling anymore. I never needed to scream and shout and shut myself in my room again. I found some new friends and I did have a happy life. 1. What did Mary’s family expect Mary to be like? 2. What name was she given in the family? 3. Did other members of the family also have ‘names’? Do you remember any of them, for example one was ‘The noisy one’. 5. How did they tease Mary? Was that fair? 6. How did Mary act when they teased her unfairly? 7. Who noticed that Mary’s problem could be solved, and what did that person do to help? 8. How did Mary act after she and her family had a new agreement, and what was the agreement? 9. Does the story remind you of anything in your life? A Chinese woman in traditional dress came to tell me this story. My story starts on a train. I am boarding it, a young girl travelling away from my family to start working in the city.I feel rather afraid and very alone. My uncle and aunt have made arrangements for me to stay with friends of theirs. These people have found work for me. I am to work in a factory and to pay them rent and to send the rest of my earnings back to my family. I am only fourteen years of age. I know nothing about these people. I only know that they will meet me at the railway station and that she will be carrying a pink parasol and he will be holding a bunch of chrysanthemums, which he will give to me. I will accept them and tell them my name, which is Celine. I will follow them to their apartment and be given a room. There I will stay for an undecided period of time – at least a year and depending upon what my parents and my landlord think, possibly a lot longer. They are there to greet me. They recognise me first, because I have the red suitcase my aunt had told them about. They look pleasant enough. The woman bows and the man gives me the flowers. I notice a certain look in his eye which makes me uncomfortable. I spend a month there in that apartment during which time the man never speaks to me. The woman is kind but very shy and retiring. Her husband is very much the controller in the household. She is told by him what I can and cannot do, and this she conveys to me shyly, apologetically. He starts to impose various rules upon me. I must change from my work clothes into a housecoat as soon as I return from the factory. I must wear ‘these shoes’. I must twine my hair in this manner. There is a photograph on a shelf in the main living room. Gradually I realise that he is turning me into the woman in the picture. He does not seem to look at me but I notice that he watches me furtively when his wife is not in the room and when he thinks I am not noticing him. I ask the wife about the woman in the picture. For the first time her normally docile eyes grow dark. Her face tightens. I felt my heart lurch and my stomach tighten. It seemed as if he was trying to turn me into his first wife. The last thing I wanted to do was to become anyone’s wife, let alone his. He already had a wife, surely that would stop him from wanting me. But it did not. I was unable to write to my parents about my problem because they could not read and I could hardly write. Suddenly the problem became much more pressing. The man brought me another bunch of chrysanthemums and in front of his wife he gave them to me. He stroked my head and his wife looked away. I began to feel very nervous. The way he looked at me was the look of a hungry dog. He did not hide his emotions any more. His wife kept out of the way when he and I were in the room. I wished I had a lock on my bedroom door, but I did not. He used to stroke my hair and smell his hands. I tried not to let him but I could not prevent it. One day after coming up behind me and burying his head in my hair he pushed me into my bedroom. I was so shocked. I shouted but his wife had gone out. There was no-one to hear my pleas. He had his way with me. What could I do? Afterwards he was contrite. He did not speak to me again. His wife became very attentive towards me. She apologised for her husband’s behaviour. She said she would look after me. She did not need to, he stayed away; but I was pregnant. I did not realise what had happened to me for several months, but I began to feel very heavy and tired. The woman said that I must leave work and again that she would look after me. That she did, always sending money to my parents every month. They had no idea what was happening to me, no-one knew, except for one of the under managers at work, she had her suspicions, but as she knew my landlord, I could not tell her what had happened. I had the baby and the landlord and landlady helped me at the time of its birth. I wanted to hold it to me but they refused to let me see it. They turned me out of their house, keeping my baby for themselves. I was distraught. What could I do? I thought of the under manager and found my way to the factory. People were arriving for the morning shift. They gave me strange looks but nobody made any remarks. The under manager was very understanding. She said she was not surprised. Old Lee had always wanted a son and now he had one. She told me about a home for ‘fallen women’ that I could go to, to recover my strength. I did that and managed to find other lodgings with one of the girls at the factory. When I told the girls what had happened they all said that it was a terrible shame that this had been my fate. They also said that the best thing I could do was to let go of the memory. Pretend it had never happened. Tell myself I did not have a son – or the memory would eat away at me for the rest of my life. They told me that I was beautiful and had my own life to lead, and that I should take comfort from the fact that my child would be brought up in a home that would be well provided with all his needs. He would never know his true mother but at least he was wanted, whereas there is no way I could have provided for a child in my situation. It took me several years to truly forgive my landlord and his wife for their cruel deception, but one day I heard from the under-manager that they had become benefactors to the children of parents who sustained injuries at the factory. They were very generous with their money and so in some small way had made recompense for their terrible crime. I forgave them and it was as if a great weight had been lifted from me. I could smile freely again and I found a loving husband, and had a child of my own, a little girl whom I loved dearly. I never told her about her brother. It was not a burden to be shared. The forgiveness had lightened it considerably and I did not wish anyone else to feel the weight of it again.